1 B None No Power Seat 1 B is a standard recliner-style First Class seat located at a bulkhead. Floor storage for personal items is not available for use during takeoff and landing. The proximity to the galley and lavatory area might be bothersome. 10 A None No Power Seat 10 A is a standard seat in the Delta Comfort+ area that features additional legroom. There is a modified hanging cabin separator/bulkhead directly at eye level. The tray table is installed in a fixed armrest, therefore, seat width is slightly reduced. 10 B None No Power Seat 10 B is a standard seat in the Delta Comfort+ area that features additional legroom. There is a modified hanging cabin separator/bulkhead directly at eye level. The tray table is installed in a fixed armrest, therefore, seat width is slightly reduced. 10 D None No Power Seat 10 D is a standard seat in the Delta Comfort+ area that features additional legroom. There is a modified hanging cabin separator/bulkhead directly at eye level. The tray table is installed in a fixed armrest, therefore, seat width is slightly reduced. 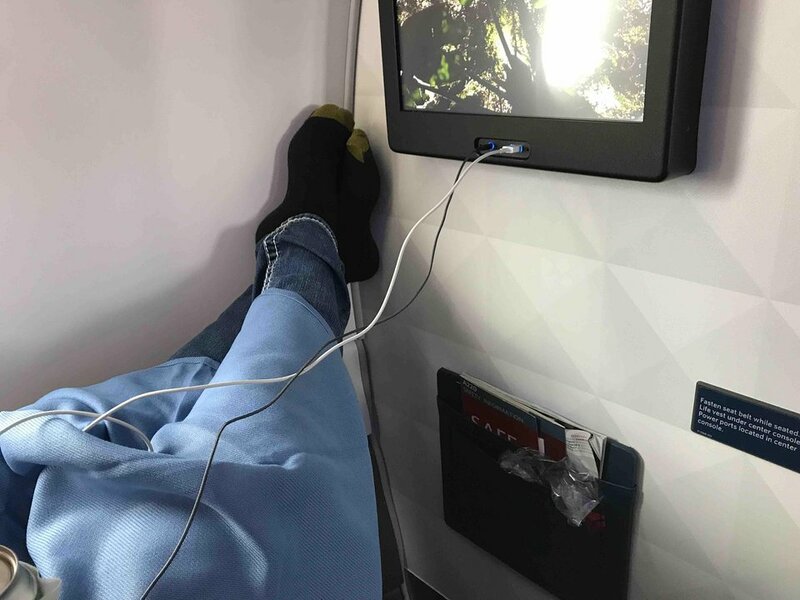 10 E None No Power Seat 10 E is a standard seat in the Delta Comfort+ area that features additional legroom. There is a modified hanging cabin separator/bulkhead directly at eye level. The tray table is installed in a fixed armrest, therefore, seat width is slightly reduced. 11 A None No Power Seat 11 A is a standard seat in the Delta Comfort+ section that features additional legroom. 11 B None No Power Seat 11 B is a standard seat in the Delta Comfort+ section that features additional legroom. 11 C None No Power Seat 11 C is a standard seat in the Delta Comfort+ section that features additional legroom. 11 D None No Power Seat 11 D is a standard seat in the Delta Comfort+ section that features additional legroom. 11 E None No Power Seat 11 E is a standard seat in the Delta Comfort+ section that features additional legroom. 12 A None No Power Seat 12 A is a standard seat in the Delta Comfort+ section that features additional legroom. 12 B None No Power Seat 12 B is a standard seat in the Delta Comfort+ section that features additional legroom. 12 C None No Power Seat 12 C is a standard seat in the Delta Comfort+ section that features additional legroom. 12 D None No Power Seat 12 D is a standard seat in the Delta Comfort+ section that features additional legroom. 12 E None No Power Seat 12 E is a standard seat in the Delta Comfort+ section that features additional legroom. 15 C None No Power Seat 15 C is a standard Economy Class seat located in an Exit Row. Seat back recline might be restricted due to the Exit Row extension located directly behind. 15 D None No Power Seat 15 D is a standard Economy Class seat located in an Exit Row. Seat back recline might be restricted due to the Exit Row extension located directly behind. 16 E None No Power Seat 16 E is a standard Economy Class seat located in an Exit Row. There is additional legroom and additional personal space due to absence of a seat in front. The tray table and inflight entertainment monitor are installed in a fixed armrest, therefore, seat width is slightly reduced. 28 A None No Power Seat 28 A is a standard Economy Class seat in a last row of the aircraft. Seat back recline might be limited due to the wall of a bulkhead located directly behind. 28 B None No Power Seat 28 B is a standard Economy Class seat in a last row of the aircraft. Seat back recline might be limited due to the wall of a bulkhead located directly behind. Delta Studio presents a variety of music for listening pleasure. Each month a special selection of various artists is featured. Selections are accessed via seat entertainment monitors and also through onboard streaming to your own personal device. Delta Studio presents several selections of films, television programs, children's programming, live satelite television channels, and games. Selections are accessed via seat entertainment monitors and also through onboard streaming to your own personal device. Each seat features a 110V AC power outlet and a USB power port. Gogo 2Ku is available to access the internet and for streaming entertainment to your own personal device. Various plans are available for purchase. Details are available on delta.com. Delta Airlines describes their Airbus A220-100 aircraft as a "state-of-the-art narrowbody jet with all of the amenities and luxury of a widebody aircraft." The interior design of the aircraft is a result of Delta's research asking passengers about their onboard preferences. All seats feature high-resolution entertainment monitors and personal power ports. Large overhead bins for carry-on bags are available and ambiant LED cabin lighting is featured. The aircraft is configured with 12 recliner-style seats in First Class, 15 extra legroom standard seats in Delta Comfort+, and 82 standard seats in Main Cabin Economy. The seat itself feels nice and modern. The IFE is responsive and the screen is very large for a regional jet. Recline is just want you'd want for a short nap. I feel the storage in the seatback could be improved in terms of capacity but overall is good. Windows are large and there is a personal vent fan (in First class at least, not 100% about Comfort+ and Main Cabin). Mood lighting was nice. Delta flies 1 versions of Airbus A220-100.